The journal Molecular Carcinogenesis, edited by Wiley, has recently published an article about the Antitumoral activity of Lepidium latifolium and the identification of epithionitrile 1-cyano-2,3-epithiopropane as its main major component. This article shows the results of the research carried out for more than a decade by several Spanish researchers, including María Conde Rioll, who is in charge of the Laboratory of Cell Culture of the R&D Department of Soria Natural. Her participation is set within the agreement signed in the year 2004 by our company and the Cancer Research Center of Salamanca, Spain. Together with María Conde Rioll, the research team of the Laboratory of Cell Death and Cancer Therapy of Biological Research Center (Madrid, Spain), the Cancer Research Center of Salamanca (Spain) and the Institute of Bio-Organic Chemistry ‘Antonio González’ of the University of La Laguna (Tenerife, Spain). According to this article, ‘consumption of Brassica (Cruciferae) vegetables is associated with a reduced risk of cancer’. However, there is still much more to be known about its active components and its molecular activity. That is the reason why the research team, of which Conde Rioll formed part, started its work for locating compounds of interest with antitumoral activity more than a decade ago. In particular, the team focused on the study of Lepidium latifolium, a cruciferous plant native to southern Europe, Mediterranean countries and Asia, which is popularly known as pepperwort. Their research work concluded that Lepidium extract has cytotoxic activity, in other words, it has the capacity to destroy cancer cells. Besides, the juice of this plant shows antitumoral activity. The epithionitrile 1-cyano-2,3-epithiopropane (CETP) was identified as the most important anti-carcinogenic principle active of Lepidium latifolium. 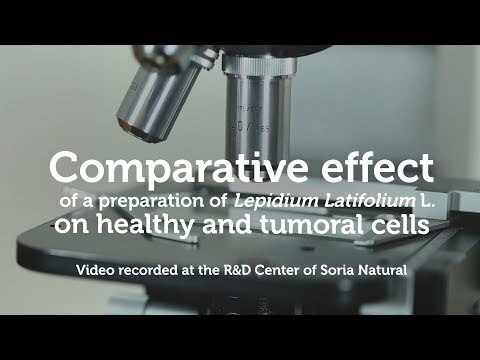 In the following video, two in vitro assays carried out at the R&D Laboratories of Soria Natural compare the effect of the active principles of the medicinal plant Lepidium latifolium on healthy and tumoral cells.